The 27th of March is, officially, the Day of the Sakura in Japan. Not for any reason in particular, but rather because the sakura is an iconic flower in their culture and usually blooms around the end of March, beginning of April, which itself initiates the celebration of hanami, the celebration of spring. The Japanese, traditionally, have a sad but beautiful way of looking at the world, and hanami is part of it. Sakura - cherry blossoms - flower very briefly, and all fall together. Hanami itself is only half about welcoming in spring; it's also about appreciating the fleeting nature of beauty. They don't seem to have any mind for permanence nor perfection and live in what I would considered a more enlightened frame of mind, one that logically would lead to less hoarding, less focus on material things and more focus on the moment. The same can be said for Kintsugi, a centuries-old art of repairing pottery with gold. While in the West we typically try to make things look as good as new, the Japanese have long had a habit of highlighting the breakage and making things look more wonderful and evocative for it. Cherry blossoms are one of the first hints that spring is coming. From my window, the trees in the park are all still bare and brown; one or two are beginning to get bobbly with budding leaves, but they still look a long way off of fully waking up. Then there are the smaller trees at the edge. White and pink spots of wonder to catch the eye, a promise of brighter, lighter things to come. My favourite cooking website, Just One Cookbook, originally raised my awareness to the fact that sakura flowers are actually edible through her sakura cherry blossom cookies recipe. But beyond trying the recipe for myself and including some of the flowers in my first canvas cake, I've not really tried very hard to integrate them into other things. Unsurprisingly, there are many sakura sweets across Japan during hanami, from simple sakura tea to pink mochi (sweet rice balls with red bean paste) and dango (sweet rice dumplings), all the way to the far fancier sakura milk pudding, so I knew that they were quite versatile. And that is where this seasonal spring porridge comes in! 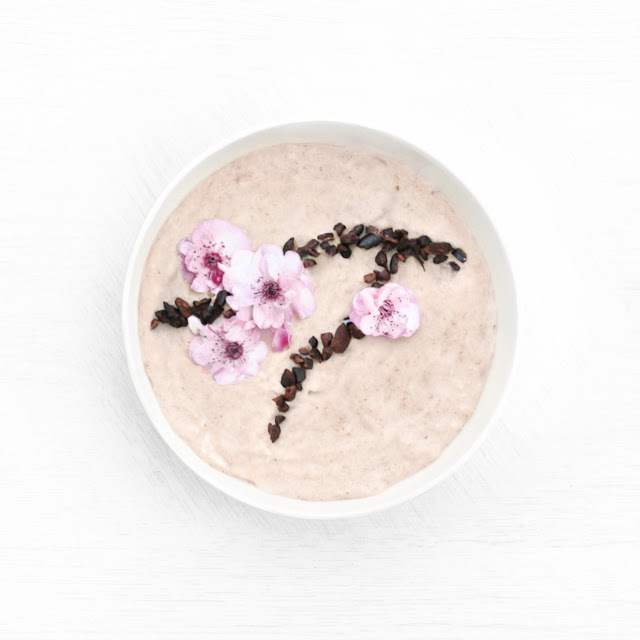 Delicate, aromatic, and a wonderful way to greet the first days of spring, this sakura cherry blossom porridge is unique and fragrant with a very subtle (but present) flavour. You can use fresh cherry blossoms, if you have them, or you can use pickled cherry blossoms (which means they've been salted, and the salt is removed by soaking for 30 mins to a flawless flavour) and have a taste of spring all year round. How very Western. I've gotten quite into overnight oats, though I always heat them up in the morning. It saves active work first thing in the morning and gives you a much creamier texture - I love it! I've not changed any of my recipes for it, I use the same oats, milk, water, protein etc, the only difference is that I throw it all into a shaker bottle to properly combine it all before pouring it into my bowl and setting it in the fridge overnight. I take it out in the morning, give it a stir, then heat it in the microwave or on the hob for about 5 minutes. All of my porridge recipes are suitable for doing this way, and this one is no different. You may have noticed that I've started adding the method into all of my porridge recipes. 1. Soak the sakura flowers in cold water for 30+ minutes to remove the preserving salt or remnants of 'outside'. This is the first step that follows any recipe using sakura flowers, including sakura tea, which is often drank at Japanese weddings. 2. 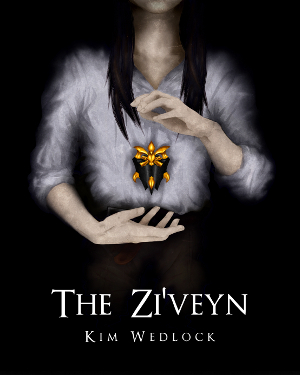 Chop the flowers into bits, or pull the petals apart. The sakura flower, stem and even leaves are edible, so don't worry about being precise. Though I did remove the stems for aesthetics. 3. Combine 100ml of boiling water and 50ml of milk in a cup and add the flowers. Set aside until cooled, about 20 minutes. 4. 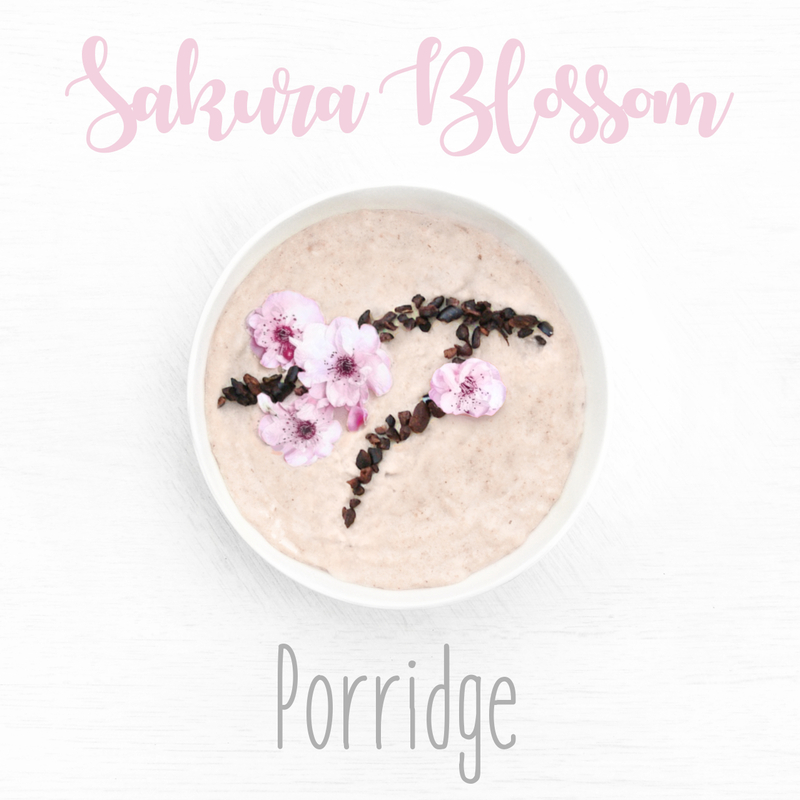 Combine all your dry ingredients in a bowl or jar (or shaker bottle), add 100ml of the sakura tea (with petals) and stir it all together (or shake it, then pour into a bowl) and set it in the fridge. 4. If you're making it on the stove, combine all the dry ingredients in a pan, then stir in the sakura tea (and petals) and additional 50ml of milk. Mix until combined and heat over medium until just beginning to boil, then reduce the heat to low and allow to thicken for 15 minutes or so. 5. Garnish with a trail of cacao nibs to make a branch, then add additional flowers - soaked or fresh. If you'd like it a little sweeter, add a little honey. • I used 1/2 packet Stevia. • I use Pulsin's premium whey protein. • I used 5 sakura flowers, and after soaking, pulled off the stems and pulled apart all the petals before brewing. • If you don't have fresh sakura blossoms on hand, you can purchase salted ones from Nihon Ichiban. 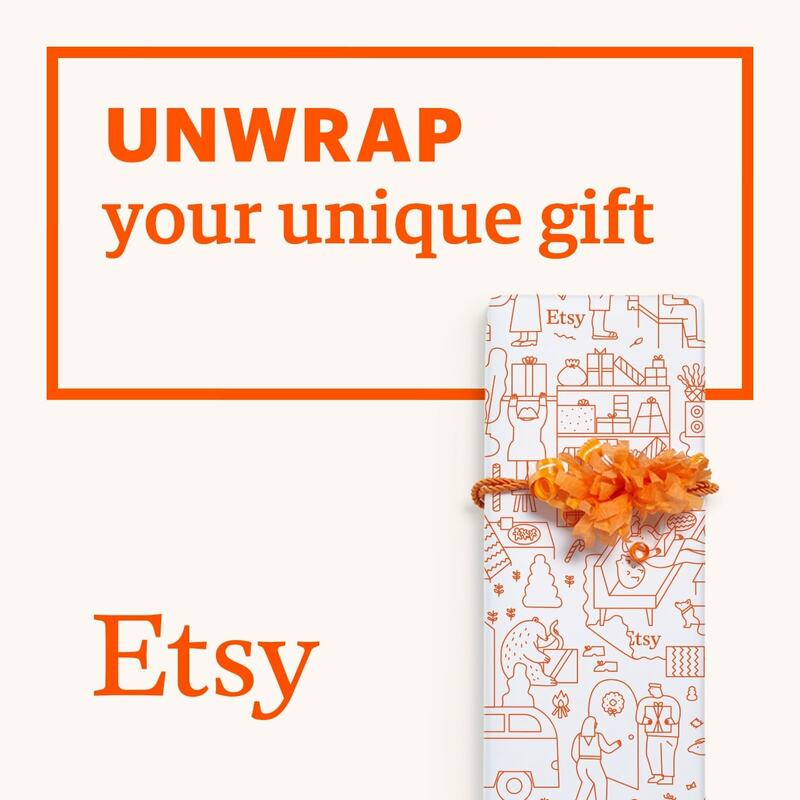 I've used them a few times for a variety of Japanese ingredients, and they ship fast worldwide. Salted blossoms need to be soaked for 30 minutes before use but the flavour remains the same.